Black and White was massive for me. I had a wolf and trained it to pick people up, throw them into the sea and then go and rescue them for praise from the other townspeople. I spent a long time in my teens playing that game and I still regard it highly. 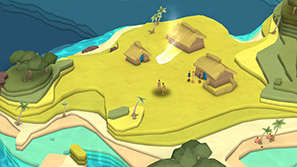 The god game genre has been in decline for a while, with games like Reus missing the mark, and I was initially hopeful that Godus, Peter Monyleux's new god simulator would mark a strong return for the genre. Oh boy..
Godus has been available in early access for a while now and I've heard and read many things about it. I held back from buying it but it was recently 66% off and I took the plunge. The version I have played is 49% complete. First things first, Godus is a beautiful game. The colours are rich in saturation and the layers of the scenery are great to look at. When I built my first beacon of expansion and the previously grey area around it burst into colour, revealing higher mountains with dozens of differently coloured layers I exclaimed a 'wow'. The water effects look great too and the animations are fine. The sound design is functional but not particularly memorable. In Godus you are a god. You have a couple people and its up to you to create a thriving civilisation. You do this by manipulating the layers of landscape, moving them to create enough space for blueprints to be placed. You don't place them yourself, it's automatic leaving you with little design choice. Once a plot has appeared you can tap on a already built house to send someone to go build it. The number of people in your civilisation increase as you build housing. It's fun and relaxing to craft the area for your people to live in. That's about where the praise for the game ends. 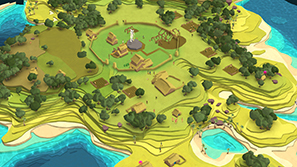 There are so many things wrong with Godus it's hard to know where to begin. Let's talk about belief. You spend belief doing anything with your godly powers; moving the landscape, lassoing a follower to go build when they seem reluctant, building a farm and many others. You gain belief when purple orbs appear above houses and you click and drag the cursor to collect it. In the third upgraded house you get 300 belief an hour. To put this into perspective building a farm costs 10000. In my three hours I've not at a single point had that much belief at once. To expand your area of influence you need to pray at (or build. I'm not entirely certain) a beacon of expansion. You can only see one at a time (making your progress surprisingly linear for a game of this genre) and the one I'm at now took half an hour! Half an hour before I could build or do anything as I'd already filled up my current landscape. It appears nearly everything is reliant on a counter (usually with unreasonably high starting times). The game's counters continue after you quit but that's no good. I want to sit down and play for an hour or so but can't because I have to wait for this ridiculous time limits to pass. Upon booting up the game again you'll have belief orbs over nearly all of your houses giving you some power to play with but this seems a backwards way of playing. Why would you create a game which actively encourages you to stop playing and come back later? The answer to that is a 'Pay to Win' implementation. I don't know if that is what they are intending but it seems apparent that is where the gameplay is heading. There is belief, unreasonably long cool down times, cards, stickers and chests which are presented in such a way I believe points to monetization. If so, I hope this game fails on a monumental scale. These aren't the only flaws in Godus. In order to create space for your civilisation to grow you are required to destroy the environment. While this isn't necessarily unusual when building a city, each house has a margin around it that is far too large. This makes your houses spread out too far making your settlement feel poorly built and impersonal, but you have no control over this. You also can't plant trees or anything like that so it's just a large plain with houses far away from each other. There only seems to be abodes at the moment too (I've just unlocked farms but can't build them yet). Why are there no schools, pubs, markets or anything like that? It doesn't feel alive. There are chests hidden in the environment. These hold stickers which you need to apply a certain number of to cards to unlock abilities and buffs. While at the start this is okay as they are easy to locate, later on they are hidden under many many layers of land ensuring you waste precious belief dragging the landscape back trying to find it. Also, that whole system just feels convoluted. I haven't even mentioned the other problems with it. Scrolling and rotating the camera is far too slow, the game crashes every time I quit making me restart my PC, the camera often pans very quickly to some random far away part of the map. There is one other gameplay mode I've found. By finding and building the pre-placed dock I can go on Voyages of Discovery. This is essentially a puzzle mode where you are rewarded stickers for guiding a certain number of followers to a temple on a small isolated bit of land. There are obstacles hindering the route but all so far are just solved by dragging landscape. At first this was a welcome change of pace but it quickly loses it's novelty and sense of fun. Godus is halfway complete so it's hard to say which direction they are going to take this in. It's baffling at the moment; seemingly going for the mobile 'free to play, pay to win' market with a genre and creator that has established fans in PC gaming, with a PC early access version. Who is it for? 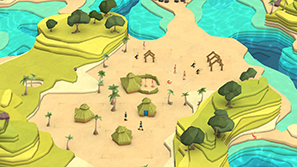 I enjoyed my time with Godus before the ridiculous cool down times kicked in. There is a potentially great game hidden behind so many confusing design choices. It's fun to play when the pacing is what you'd expect and the graphic design is wonderful. But these aren't enough when there are so many problems. Problems which seem intentional from 22 Cans. If it does go the way of full monetization I can't see a way that I'll be able to take Molyneux seriously again in gaming. �The regenisis of the God Game� states the delusional slogan. If this is where the genre is headed I will happily not play a God Game again. 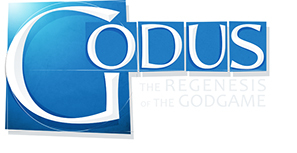 I can't see Godus ever being a valuable gaming experience. The only way this will happen is if they remove the exploitative mechanics which appear ready to require you to pay money just to play the game.